964 people want to do this. 115 people have done this. 2. I am free spirited. 3. I truly care about people. 5. I have a beautiful face. 6. I have a perfectly curvy body. 7. I am strong mentally and physically. 6 - My artistics skills. 7 - I'm easy to live with. 8 - I like my job. 10 - I learn things fast. 12 - But i'm calm. 13 - I like to help people. 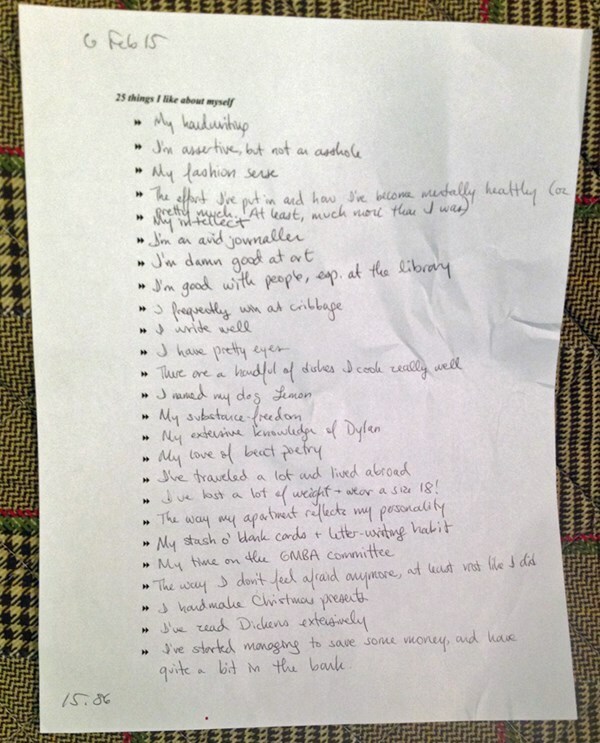 14 - I'm a empathic person. 15 - I make a good coffee. 17 - I have a very good past. 18 - I have a lovely family. 19 - I have some street skills. 20 - I choose the good friends to be close. 21 - I have a super dog. 22 - I know how to sing. 23 - My caligraphy is pretty. 24 - I have a confortable life. 25 - I like my energy. 4. My love for learning. 5. My love for God. 7. My love for my kids. 8. My love for my close friends. I am loyal, intelligent, compassionate, prioritize friends/family. I've made peace with my bipolar depression and am learning to live with the highs and the lows. I'm brave enough to try new things, even when they are (way) outside my comfort zone. 24. My health is pretty good! 18. I've lost a lot of weight and wear a size 18! 25. I've started managing to save some money, and have quite a bit in the bank. 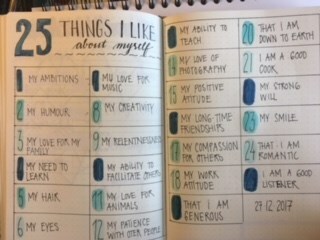 25 things I like about myself. 13. I am an AWESOME mom. 14. I am honest about how things are going in my life, with my friends. 15. I have really pretty hands and nailbeds. 16. I set a goal to study abroad for one year and I DID it. 18. I have an eye for details. 19. I let my friends know how important they are to me. 20. I am learning to let myself accept my imperfections. 21. I still understand a lot of spanish. 22. I genuinely want others to succeed. 23. I have a little freckle on the top of my right foot between my littlest toe and my second littlest toe that I love. 24. I had a water birth VBAC even though it was initally a really scary idea to attempt one. But I educated myself and worked through my fears, with Jeremy, and I did it. One of the best days of my life. 25. I constantly seek to better myself. 26. I encourage myself and repeat positive affirmations. 27. I believe in the Law of Attraction and the power of the universe. 28. I am a work in progress. 25. I'm the best aunt! Start these list at 21.12.12. 03. I'm talented to settle a dispute. 04. I'm a good driver. 05. I have good logical reasonig skills. 06. I'm outgoing and sociable. 07. I respect other people and consider off them and their feelings. 09. I´ve a sense of humor. 10. I can laugh about myself. 1. Labai myliu savo draugus. 7. Kai užsispyriu, galiu padaryti bet ką. 8. Man rūpi kitų jausmai. 11. Įsijaučiu į kito žmogaus jausmus, pasakojimus. 13. Į savo namus atnešu įdomių idėjų. 14. Skatinu mamą(ir kitus žmones) tikėti savimi, nepasiduoti. 19. Neskaudinu kitų, nes žinau kaip tai skaudu. 25. Esu kitokia, turiu įdomių pomėgių. 4. I have good collarbones. 5. I have a genuine smile. 7. I have a good sense of humor. 8. My body makes amazing, strong, healthy babies. 9. I like to try new things. 11. I am a good writer and communicator. 23. I am comfortable with being who I am and liking what I do. 1. That I try to be a nice person 2 .that I love my kids 3. that I love to read. 4, that I try to always think of others, 5. I've started this - 3 things! Can't think of anything else but I have 1001 days. Stubborn as hell when i need to be. I know how to take care of myself. I am able to conquer my fears. 1. I'm grateful. 2. I'm easy to talk to. 3. I'm sporty. 4. I love animals. 5. I like my studies. 6. I know how to take care of myself. 7. I'm an easy learner. 8. I'm knowledgeable about medicine. 9. I know how to ride a horse. 10. I enjoy my own company. 11. I love to dance. 12. I like to help others. 13. I love to read. 14. I'm caring. 15. I like to sing. 16. I enjoy playing guitar. 17. I'm simple. 18. I like to hang out with just about anyone. I'm not sexist,rasist or anything like it. 19. I enjoy driving my car. 20.I like to smile. 21. i love my hair. 21. I like my style. 22. I love to try out new things. 23. I like my way of doing things. 24. I like my body type. 25. I like my flexibility. 1. My eyes 2. My hair 3. My dancing style 4. My teaching style 5. My growing self control 6. My determination 7. My willingness to try 8. My positive attitude 9. That I try to take everything into consideration 10. That I like to read 11. That I am strange 12. 13. 14. 15. 16. 17. 18. 19. 20. 21. 22. 23. 24. 25. 1. my hair 2. my style 3. how I can help friends feel better 4. my intelligence 5. how I love unconditionally 6. my addiction to flip flops 7. my singing voice 8. my kindness 9. my patience 10. my want to help people 11. the way I dance 12. my love for life 13. my self-control 14. the way I laugh 15. my need to search for the answers 16. 09/08/10- I have come up with 7.